After the false alarm in Hawaii, I'm waiting for the guy who looks around when he comes out of his bunker twenty years from now and says, "Wow! Things recovered really fast! Wait... What?!" Yes, I know I recycled that joke but I'm just so proud of it. But seriously, have you ever been in a situation where sudden death seemed eminent? It's a life changer. Well, it is for at least the hour it takes the adrenaline rush to wear off. I'm gauging that by how long it took me to decide there was nothing better to do than go back out riding after a 40mph van flung me off my bike in Phoenix years ago. I remember the moment when I realized I couldn't get out of the way in time. The instant I realized it, my mind moved on to other things like, "Crap! I was really looking forward to a Filiberto's burrito! I really wanted to get married, too. I can't believe how warm it is tonight!" The bible says we're waiting for the current heavens and earth to be catastrophically destroyed by fire and replaced with the new and eternal version God has in mind. I also can't wait to see the guy who's in his bunker when that happens. Maybe that's part of the biblical reference to those "escaping through the flames." 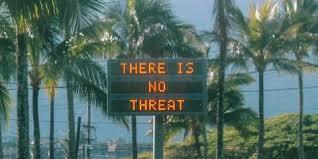 But seriously, again, we could really take a lesson from the Hawaii scare. When you're certain your earthly goods are about to burn, depreciation happens fast. The van that hit me happened to have "Jesus saves" smudged with a two-fingered line into the dirt on the rear window. Since the irony is obvious, I'll move on to say the driver wasn't excited that I noticed as the policeman quizzed him about more pressing "ironies". Let's at least correct the one where we say we're living for the Kingdom while we're collecting as much as we can for the fire. It's worth repeating the story that when Rockefeller died, his accountant was asked how much he left. He answered, "All of it." Put it where it lasts. To the Kingdom.